“Oh my God” became the phrase of the day when we got to swim with whale sharks in Oslob, Cebu. It was my first time to see a butanding up close. To actually swim with one was an out-of-this-world experience—even scary, too! I super enjoyed this experience but my friends who have been to Sorsogon for whale shark watching say that Oslob fails in comparison. I guess if you haven’t seen a whale shark in your life and you happen to be in Cebu, you might as well go. It only takes half a day max! 2. Ride aircon bus to Oslob (Php 155). It’s a 2-hour trip. 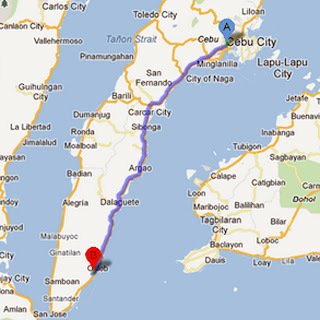 Traveling from Cebu City to Oslob is around 2 hours by bus. We left Cebu City at 3AM and arrived around 5:15 AM. Cands and I sat on plastic stools because the bus was full. If you opt to ride the aircon bus, wear a jacket! It's REALLY cold. If the conductor asks you where in Oslob you're going, just tell them you're off to see the butanding. The drop-off point is in Tan-awan, Oslob.. Forcing a smile at 5:30 AM. No decent sleep yet. Very excited, though. Saw the sun rise while waiting for the orientation. The orientation can get pretty funny! Try not to laugh, though. "Do nat put on bebe owel or sanblak! Do nat powent eyni shyarp objek to da butanding." After the orientation, our group was given a number. This indicated the order in which the groups would see the whale sharks. This was also the time to rent life vests, snorkels, and for everyone to change into swimwear. When our number was called, we were instructed to go to our assigned bangka. The Manongs would do the paddling for us. Pump boats aren't allowed here. Other groups equally excited to see the whale sharks. This is where we all started screaming! We were all smiles when we finally saw a butanding! The Manongs told us we could get in the water already. Shortly, a whale shark swam by! There was even a baby whale shark under it! Here's a video I took. I got so scared! The butanding was HUGE and it swam so close to me! "OMG!" An indication that a whale shark was coming! We felt like we were drowning in huge waves... plus the fact that we still had no sleep. But all's good. We were in the water for a good 30 minutes. This is the new time limit. The 40 minutes ended so quickly! Drying off before heading to Moalboal. Total cost for Whale Shark watching: ~Php 500! There was supposed to be a Php 200 fee to take underwater shots but our guide didn't charge for it. A hickey from the butanding. Haha! No, really, I got this while climbing on to the bangka. Was so tired after braving the waves! Interestingly, guidelines for whale shark watching were implemented just this January. These include a 30-minute time limit for whale-watching and a 1 PM curfew. According to this article, guidelines were finalized early this month. I wonder if they have the full guidelines uploaded somewhere. In my opinion, these guidelines may pave the way to the eventual banning of whale shark watching in Oslob. You may want to take advantage of this time to swim with them before it's too late. For more pictures of our butanding adventure, click here. oh great!!! so if you're there early you can basically stay till 1? Hi! Do the buses from South Cebu bus station to Oslob leave at certain times only? Or will they be available the entire day? Same question for buses from Bato bus terminal to Moalboal. Thanks! Hi Madeline! If Im not mistaken.. the bus leaves only at certain times in the day--though trips are pretty frequent. Same goes for Moalboal. Of course--I may be wrong since it's been such a while since we visited. Schedules may have changed since then. Hi Henson...are they the syawks scary like you? are you the whale effin' syawk?